Best of all? You can watch it on CrunchyRoll right now. I don’t even know where to start with this show. It’s amazing and I was not expecting it to be–it’s sort of that “Turned out to be Amazing even though I just clicked it for curiosity’s sake” shows. I can’t remember the last time “trouble” was this adorable. Funny story though–THIS is the series I thought I’d be watching when I saw Princess Jellyfish a while back. When I first saw the ad for Princess Jellyfish, and read the initial description (before I saw the trailer, mind you), I thought it was about a girl who met an alien Jellyfish Princess who would change her life. Well, replace Alien with Cross-Dresser and you get the same thing–just without all the sci-fi stuff. Don’t get me wrong, it was an amazing series and I adored every second, but there was always that slight disappointment that it wasn’t the sci-fi alien plot line I went in for. 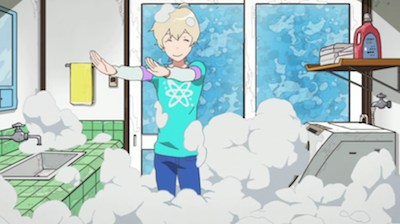 When Yuki gets anxious, it’s symbolized by drowning him in water–when something happens to break him free from his anxiety, he bursts forth from the water. It’s a really amazing effect & one of my favorite parts of the gorgeous animation. 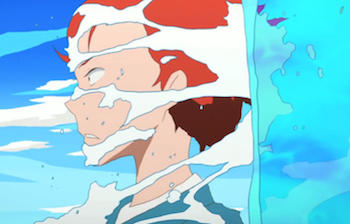 The plot revolves around Haru, an Alien, determined to make Yuki, his new best friend, an amazing fisher to help catch a certain fish he’s after (against the advice of his more sensible sister, Coco–who thinks he can do better). There’s something about saving the world, but we’re still trying to get Yuki to fish, so the save the world plot will have to wait until later. In the meantime, Haru insists on getting help from their classmate Natsuki, who is secretly the Fishing Prince (a title he despises)! Natsuki is reluctant to be seen with the class ‘oddballs’, but eventually relents when he realizes they’re serious about learning. 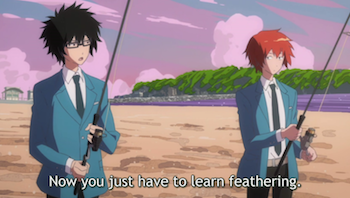 As he teaches Yuki and Haru to fish, we get to see all three boys grow and learn something about not only themselves, but what it means to interact and be friends with other people–whether it’s Haru learning to give people their space, Yuki learning to say what he’s thinking, or Natsuki learning to be patient with others. And of course, lurking alongside them all, there’s Yamada–the Indian boy with a duck. Unless the opening is lying, he’s our forth main character & I can’t wait for him to start taking more screen time and becoming a full time member of our crew~ He’s already adorable in his own right, and who doesn’t love Tapioca (his duck)? Sadly though, it looks like he’s more involved with the save-the-world side of the plot, so his big parts are probably yet to come. But all that matters, is Alien!Haru is the most adorable thing ever (he’s like a hyperactive little kid), and we’ve got the makings of bromance amazing-ness. Heck, it’s already there–it just has room to grow, and you know how I love that. I don’t know, but what I like most of all is probably how much I connect to Yuki. He’s socially anxious around new people, and I immediately connected with him–because I know how he feels. I freeze up the same way (though I recover outwardly much faster), and seeing him get over it and past those feelings is great. You really want him to learn how to fish and catch the bass and when he manages to really make friends with Natsuki–it’s just an amazing thing. Words really don’t do it justice. I’m five episodes in and really excited for more. I’m almost terrified this will be a 12 episode series, because I want more already. I can’t wait to see where the series main plot (you know, save the world) actually goes, and right now I’m loving every minute. If you like some great humorous, feel-good, coming out of your shell story–come right on in. If you just like comedy? Come for that, too. The series is hilarious on top of all the ‘aw’ moments. It’s got it’s serious side too, though, and there’s one plot line involving Yuki’s grandmother I’m assuming will end in tears–but we’ll see where that goes. It could honestly go either way, though the more gut-punch ending is looking more likely considering how high and happy Yuki has become in five episodes. I look forward to it either way. 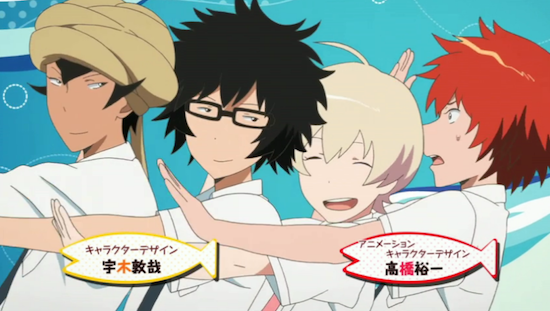 Also, the opening is absurdly addictive and adorable. The dance they do is so cute! Edit 7/7/12: I have seen episodes 6-12. Just. Just go watch it. I’d do a post on it, but then I’d have to spoil things for you and I just can’t bring myself to do that. All you need to know is the rest of the series goes completely crazy, but it’s awesome & words really won’t do it justice if I try and explain. Go watch it. Just do it. This entry was posted in Anime & Manga and tagged Haru, Princess Jellyfish, review, Tsuritama, Yuki on May 13, 2012 by Liliy.